The Cure Glomerulonephropathy (CureGN) consortium will longitudinally follow 2,400 adults and children with glomerular disease. The layout of this study was recently published in AJKD. Social Media Editor, Dr. Timothy Yau (AJKDBlog), interviewed one of the authors, Dr. Michelle Rheault (MR), about the paper. AJKDBlog: A lot of readers may not yet know about CureGN. Can you tell us about the consortium and how it came about? What are the advantages to establishing this type of collaborative effort? Each PCC has multiple subsites for patient recruitment. In addition, the University of Michigan serves as the Data Coordinating Center. Once all of the PIs were chosen, it’s only a slight exaggeration to say that they were locked in a room at the NIH until they came up with a protocol they could all agree with. There are a number of advantages in the setup of CureGN as a collaboration between these 4 PCCs. The investigators have a wide variety of expertise that they bring to the table, including experience in pediatric and adult populations, basic and clinical research, and each of the targeted glomerular diseases. It’s also necessary to have a large number of sites with a wide recruitment area in order to enroll sufficient numbers of patients with these rare diseases. Collaboration in CureGN has not been limited to academic investigators. We truly want to hear the patient voice guide our research and focus on what is important to patients with glomerular disease. Nephcure Kidney International has been an important partner in supporting recruitment and is currently funding ancillary study grants for any investigator who wants to utilize CureGN data or samples. In fact, any investigator can submit an ancillary study proposal if they have a great idea for how to use CureGN data or samples to further knowledge. As an additional way to ensure collaboration with patients, I have led a patient advisory group that meets quarterly to provide insights into what the enrolled patients are thinking about the study and what they want to learn. 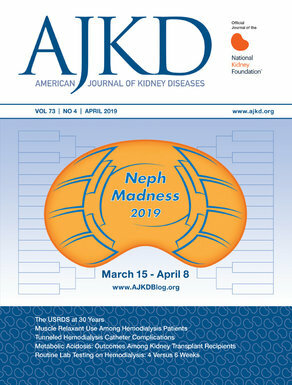 Box 2 from Mariani et al, AJKD, © National Kidney Foundation. AJKDBlog: The aim of CureGN is to recruit 600 patients each for minimal change disease (MCD), focal segmental glomerulosclerosis (FSGS), membranous nephropathy (MC), and IgA Nephropathy. These diseases were chosen because they are the most common glomerular disorders in adults and children. Let’s say I do a biopsy tomorrow on a patient with nephrotic syndrome, and the tissue comes back as MCD. Is there a way for me to enroll my patient in a participating clinical center? MR: Yes! Until June 2019, CureGN is operating under our first grant cycle (renewal for another 5 years has been submitted to NIDDK and is currently under review). Two PCCs have met their enrollment caps; however, 2 PCCs are still enrolling (Columbia and UNC and their subsites). You could check out the CureGN website to see if there is an open site near you. When the new grant cycle opens, we anticipate that all sites will open for limited recruitment to replace those participants lost to follow-up. AJKDBlog: All of these diseases are relatively rare in both adults and children. Kudos to this consortium for targeting 30% of the cohort to be pediatric population. As a pediatric nephrologist, has anything like this existed before? And can you comment on specific issues related to clinical trials in pediatrics that are unique to that age group? MR: We are very excited that pediatric patients are included in the CureGN study and think it’s so important to study these disorders across the age spectrum. The CKiD study (Chronic Kidney Disease in Children) began in the mid-2000s and is a similar longitudinal cohort study of children with all forms of chronic kidney disease that has led to numerous insights into pediatric CKD over the 10+ years of follow-up. However, less than a quarter of this pediatric cohort had glomerular disease. Importantly, CKiD identified significant differences in the risk of progression in children with glomerular and non-glomerular disorders, highlighting the need to study this population in more detail. We’ve found that many of our pediatric patients are happy to enroll. They know their diseases are rare and want to be able to contribute to knowledge that may help other kids in the future. The altruism of our pediatric patients never ceases to amaze me. In contrast to adult studies, we need to get consent from parents and assent from the child if they are old enough, which means that the child has to buy into the research as well. The only complaint I hear from the kids is the amount of blood drawn. Even though we stay well within safe limits and adjust blood volume by age, it still seems like a lot to them. AJKDBlog: How is Institutional Review Board (IRB) approval handled with so many tissue specimens coming from so many different centers? MR: Unfortunately, there isn’t a central IRB for this study so each center has to maintain their own IRB approval. The data coordinating center in Michigan and lead coordinators for each PCC have done an amazing job keeping everything organized and moving forward. AJKDBlog: You discuss in the paper how CureGN differs from other cohorts such as CRIC (Chronic Renal Insufficiency Cohort) and NEPTUNE. Can you explain what makes this prospective study so unique? MR: The CRIC cohort excluded patients receiving immunosuppression, leaving out many patients with glomerular disease. CureGN is truly the first large-scale longitudinal cohort study of patients with these glomerular diseases. NEPTUNE is a prospective observational study that enrolls patients with MCD, FSGS, or MN at the time of biopsy and includes a core of kidney tissue for study. The enrollment criteria and biosample collection protocols are similar enough that patients in NEPTUNE are allowed to rollover into the CureGN study at the end of NEPTUNE. This will allow for even more long-term follow-up of the NEPTUNE cohort. Also, IgA nephropathy was not included in NEPTUNE, leaving out this very common glomerular disorder in adults and children. Box 3 from Mariani et al, AJKD, © National Kidney Foundation. One very important, unique component of the CureGN study is the digital pathology repository. All pathology materials for CureGN participants will be centrally digitized and scored by a CureGN pathologist. These materials will be available to correlate with clinical outcomes in the future. AJKDBlog: Thank you for taking time out of your busy schedule to answer these questions! If you have a patient who may be a good candidate for this group, please visit CureGN to see a map with enrolling sites, along with contact information for the study coordinator. Hello, i am from Honduras in how i get involve in cureGN? It is posible? CureGN currently doesn’t have any enrolling sites in Central or South America. If you have an idea for an analysis involving CureGN data or samples, you are welcome to submit an ancillary study proposal. You can find more information about this on the CureGN website: https://curegn.org/Ancillary.aspx You do not need to be a CureGN investigator to submit an ancillary study proposal.